The active-lit façade of Dubai Arena ... work well on track. Leading developer Meraas says work is progressing well on its Dubai Arena project with the active-lit façade already completed and the elegantly-panelled structure now fully installed. With work already under way on the external infrastructure and landscaping, including paving and parking spaces, and finishing touches being given to the first of 46 hospitality suites, the UAE group’s ambitious project is on track for opening in 2019, says Meraas. With a capacity to accommodate 17,000 visitors, the venue located at the lifestyle destination City Walk will be able to accommodate many events and genres all year-round. Roxy Cinemas at The Yard. Major milestones reached to date include completion of the roof, façade steel structure and over 80 per cent of the roof catwalks – elevated service platforms common in major theatres and arenas. All concrete, structural and the block works have been finished and the installation of arena seating is under way, while work on fitting the arena’s rigging equipment, scoreboards, lighting and sound system will start from next month. The roof of the first-of-its-kind Dubai Arena is expected to be completed and made watertight before the end of the year, to allow the final acoustic checks to commence. The complex roof structure weighs 4,000 tonnes, equivalent in weight to that of seven A380 airplanes and is supported by two mega-trusses spanning the entire length of the venue. The construction and lifting of the mega-trusses was considered among the most challenging processes and required some of the world’s biggest cranes, with a capacity of 1,600 tonnes, to lift them into place. In total, 16,000 bolts were fitted to connect the 14 frames that make up each of the 120-m-long mega-trusses, roughly the size of a football pitch, with more than 20 tonnes of paint needed to coat them. Over 110 tonnes of show and production equipment will be placed above the arena’s versatile viewing areas, says the developer. In addition, lifts and escalators have been installed, and the remaining electrical and mechanical works are progressing on schedule. 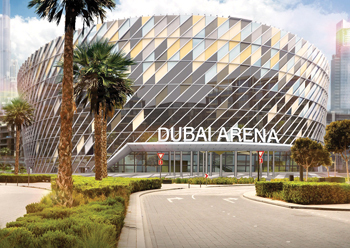 District cooling service provider Empower is due to commence tunnelling works under Sheikh Zayed Road to connect 3,600 tonnes of chilled water to the arena, and Dewa has already connected power to the building, it adds. Day-to-day operations of Dubai Arena are to be managed by Australian venue management company AEG Ogden, which also provided its considerable design and technical expertise during the construction process. Meanwhile, Meraas has started the third phase of The Yard. 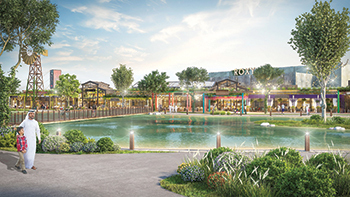 With the 200,000-sq-ft expansion expected to be ready by the fourth quarter of 2019, the new lifestyle attractions will complete the offerings at The Yard and transform it into a social hub, says Meraas. Located in the heart of an upscale residential area in Al Khawaneej, the project will feature Géant’s 50,000 sq-ft curated hypermarket space, Roxy Cinemas as well as new fashion and apparel brands, restaurants and cafes, and service providers such as telecommunication and banking. The Yard draws its inspiration from the collective nostalgia for the rustic, as well as the locality’s strong links to agriculture. In addition to featuring upcycled farming materials and other rural elements throughout the new space, an 18-m-tall windmill, and an attractively done street art all add to the charm quotient of this singular destination. The destination comprises Last Exit D89 Al Khawaneej, the food truck park launched in 2017, as well as a picturesque 350,000-sq-ft extension that consists of a courtyard known as The Barn. The Yard, which will encompass 2.8 million sq ft once completed, also features a lake with two bridges, including the Promise Bridge, in addition to shaded walking trails and landscaped picnic areas.